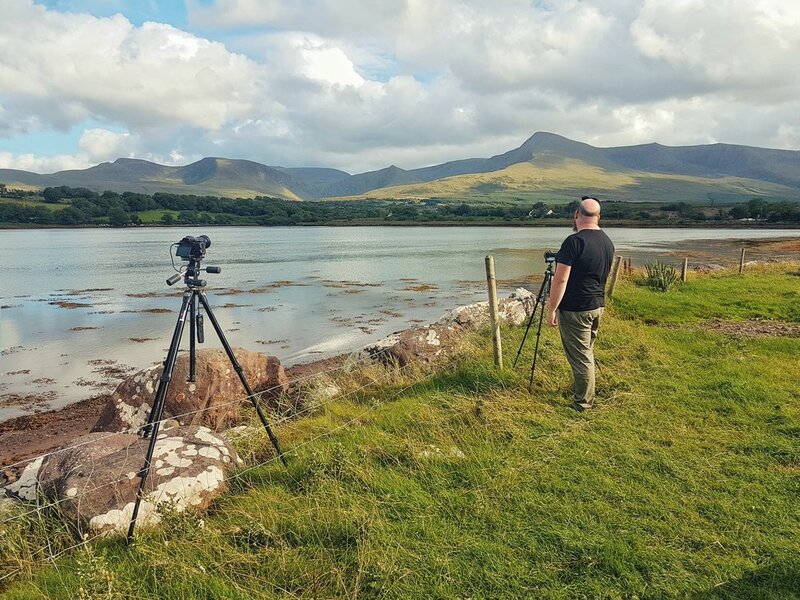 Kerry is one of Ireland’s most spectacular counties for scenery and no matter how many times we visit, we’re blown away by its beauty. It’s known as ‘The Kingdom’ for good reason and not just because of the lovely lakes of Killarney National Park and the, now famous, Skellig Islands. 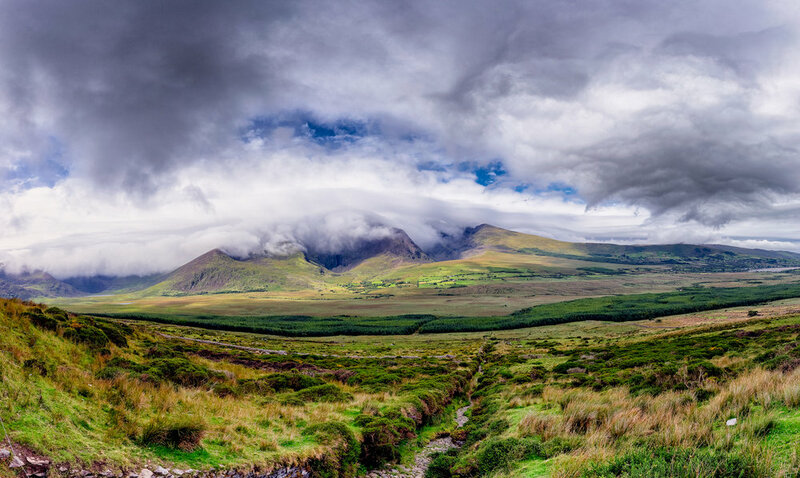 Ireland’s tallest peak, Carrantuohill, lies among its majestic MacGillycuddy's Reeks mountain range, while mysterious Mount Brandon guards the Dingle Peninsula and the popular Slea Head coastal drive. 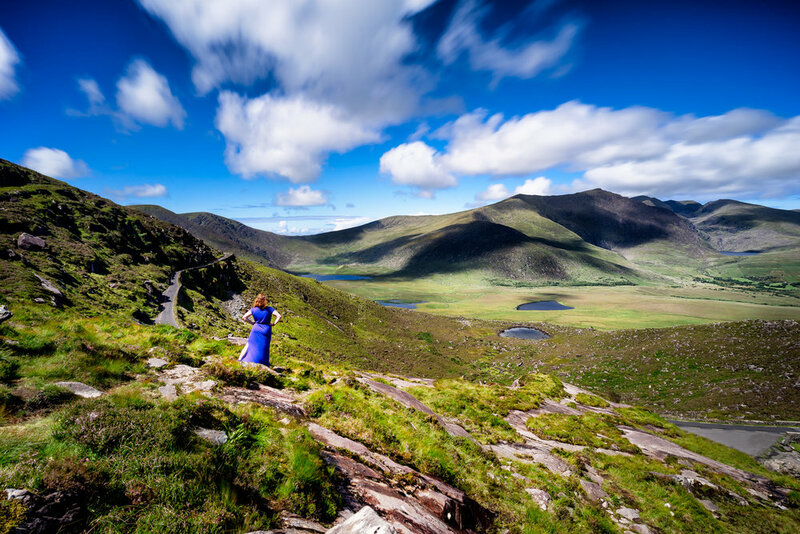 National Geographic once tipped the Dingle Peninsula to be ‘the most beautiful place on earth’ and maybe it is! It certainly keeps calling us back and it always will. Our latest visit was a long one, lucky for us, so we returned to some of our favourite spots and discovered some new ones. Neil's family took their holidays here and we got the chance to meet up with them and show off some of our 'local knowledge'! Dia dhuit (deeya gwit) - How are you? Cá bhfuil an siopa (Caw will on shoppa) - Where is the shop? Cá bhfuil an leithreas (Caw will on Lehris) - Where is the toilet? When we first arrived, the weather was wet and windy. 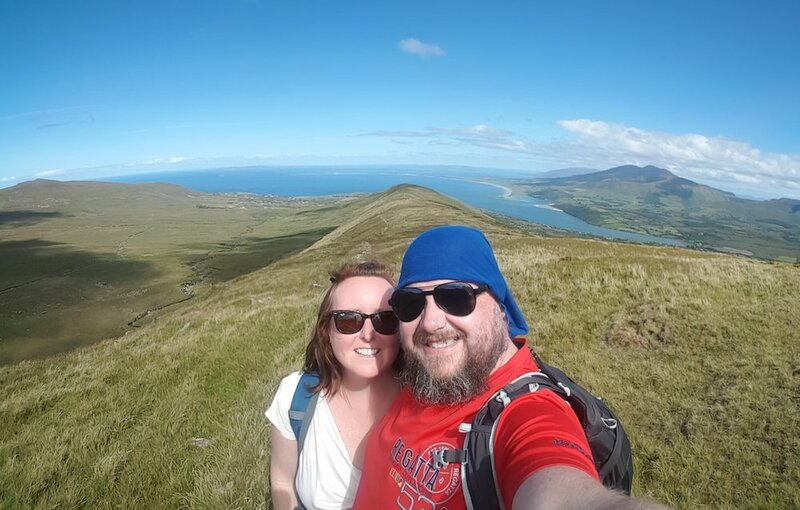 We were feeling the need for a hot shower and a bed after our few nights camping in Cork so we were delighted to get a last minute cancellation in one of our favourite hostels in Ireland, Mount Brandon Hostel. The welcome we always receive from Mary is something special. Mary is a kind soul, an extraordinary host and a well-spring of local knowledge and the hostel itself is excellent. It’s very popular with hikers and families, especially during the summer months so on this occasion we only managed to secure one night. Mary kindly offered for us to come back to the hostel any time we needed to cook or sit somewhere comfortable to work on our laptops. We made enquiries at O’Connors Bar & Guesthouse, a few doors down, who had recently started offering camp facilities in the field behind their pub. We booked a pitch for the following three nights and picked a spot right at the edge beside the sea. We were happy little campers, knowing we’d be well fed and well looked after by the lovely staff at O’Connors. Once the tent was set up we headed for Dingle. 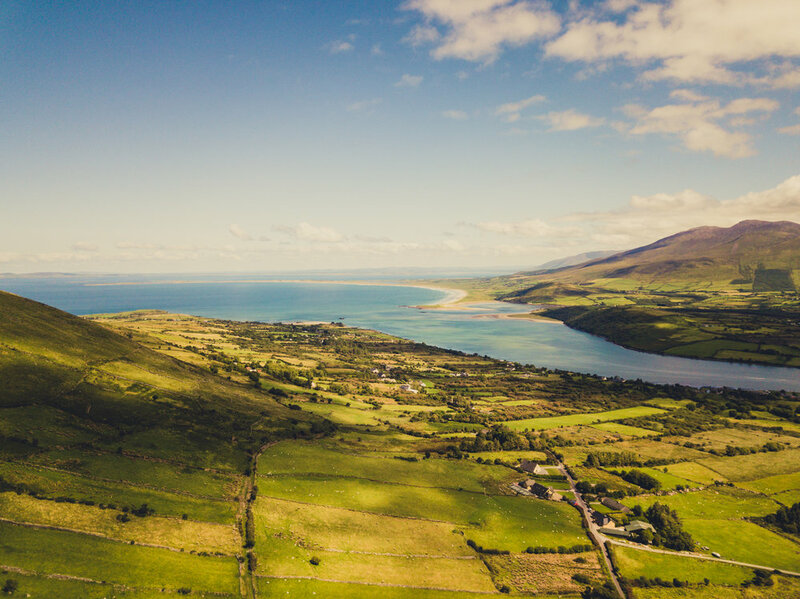 The route to Dingle from this side of the peninsula is up and over the Conor Pass, one of Ireland's most scenic drives and the highest mountain pass in Ireland. It requires patience and a head for heights because a long section of it is one-way with steep drops off the side, down into the valley below. In order for the traffic to flow, it's best if everyone drives slowly and uses the little lay-bys to enable cars to pass each other. On clear, sunny days, the views (and the road) really are breathtaking. About halfway towards Dingle it’s possible to pull in off the road and enjoy the waterfall pouring from Pedlar’s Lake. We climbed up to the lake high above it and took a break up there for some even better views and photos. It’s well worth the climb and next time we might even bring our swimwear for a quick dip. Once we got to Dingle, we went on the hunt for some nice coffee and we couldn't have picked a better place. Bean in Dingle are the first and only coffee roasters on the Dingle Peninsula so they know how to satisfy any coffee-lover's desire! Grab a coffee to go or savour it with one of their homemade brownies and sit by the window. This was our saving grace as the weather had turned again and it was really wet outside. With our shopping done, we headed straight back over the Conor Pass. The difference a couple of hours makes to the weather in Ireland is nuts! Thick, heavy cloud had descended on the route and there was near-zero visibility on the road. There was only one thing for it when we got back to our tent - the pub! Sometimes it's not so bad if the weather drives you indoors! 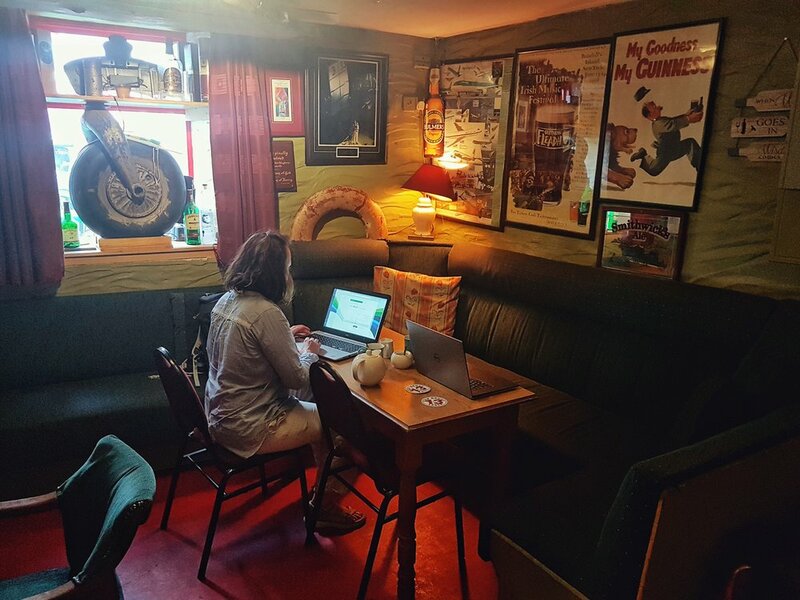 We settled in O'Connors Bar and got some work done on the laptops with one or two pints (Orla likes her Guinness and can wholeheartedly say they do a very good pint! ), followed by a lovely meal and a few more drinks chatting with the staff and the locals. We then had to run through the rain back to our tent and snuggled up for the night listening to the weather getting worse. By the time the morning came, it was nearly gale-force! Here's a little video of our poor tent getting battered! Thankfully, as the morning went on the wind died down and out came the sun - phew! We were excited to see blue skies and thought we'd have a look for a small hike to do for the afternoon. Driving towards the end of the peninsula, we took a turn that was signposted for a grotto and found a few cars parked at a trail head. We decided to chance it and see where it would lead. Thinking that it was just a small trail leading to the grotto we took it slow enough, stopping to look around at the views and then we bumped into some hikers who told us it was actually the pilgrimage trail to the top of Mount Brandon. Now, as we've made plain in previous posts, we love the outdoors but we're not super fit so we thought we'll just go as far as we can. There was no pressure on us to actually climb the beast! We got a lot further than we expected though, even if our pace was slowed to a crawl at the really steep bits. I actually thought we might even make it to the top but we came to a steep gully on the side of the mountain and the final leg of the hike was revealed. There was absolutely no way we could tackle it! There's a cross that marks the very top of the mountain and even looking up at that made us dizzy! The views we enjoyed up to that point were some of the best we've had the pleasure of seeing in the whole of Ireland. From the top, the couple said you can see right down the other side to Dingle, and further south along the coast of Kerry. Another one for the bucket list! We have to admit here that our legs were absolutely hanging off us when we got back down to the car. Mine were shaking and I felt like my feet were 3 sizes too big for my boots! I'd a big red face and Neil looked like he'd been in the shower he was sweating so much but we were truly invigorated by the experience. It was the highest we'd climbed in a long time and considering we were unprepared that day for such a big hike we were very proud of ourselves! As soon as we got back to the tent we stripped off and jumped into the sea. There are no words...I could say refreshing but it just wouldn’t do it justice. We simply floated on the water, in the sunshine, the Atlantic Ocean soothing our muscles and sore feet. The weather stayed fine for the rest of the evening so we cooked by our tent and had our dinner as the sun set. The view from our tent was certainly one of the best bedside views we’ve ever enjoyed and we stayed up until the wee hours counting shooting stars in the perfectly clear night-sky. Such a deep and sound sleep we had with no wind and only the gentle lapping of the tide for a lullaby. We took it easy on ourselves the next day and decided to head for Brandon Point, one of our go-to spots for photographs. It’s right on the edge of the Dingle Peninsula and it’s as far as you can go by car. 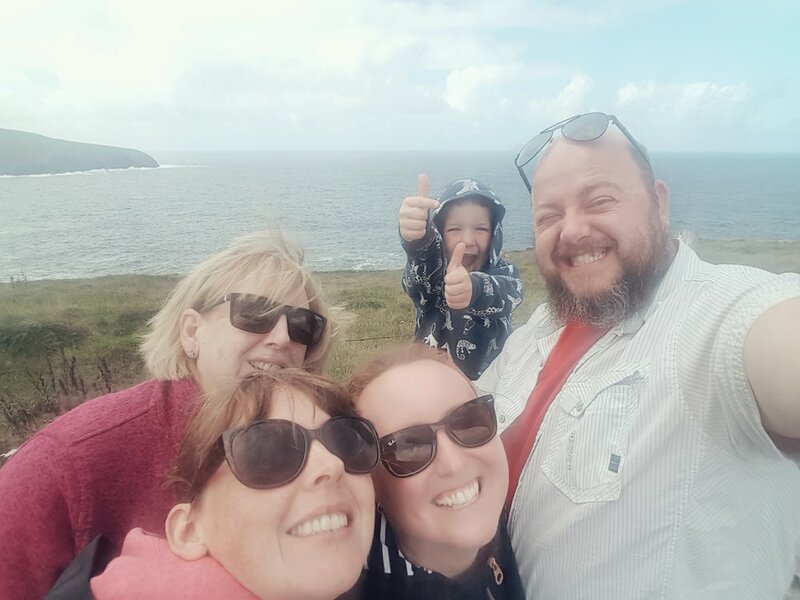 We felt like we’d walked enough so we just relaxed and enjoyed the panoramic views of this part of the Wild Atlantic Way, which are pure magic. The 6 km horseshoe bay, stretching all the way to the Magharee Islands, calls you to jump into its pristine waters and you might even get to see dolphins play in the waves below the cliffs. We sat here for most of the afternoon staring out at the vast Atlantic Ocean, watching the birds dive for fish and the clouds race over the headland. Back in Brandon we sampled a pint at Murphy’s Bar and sat on the wall by the pier. 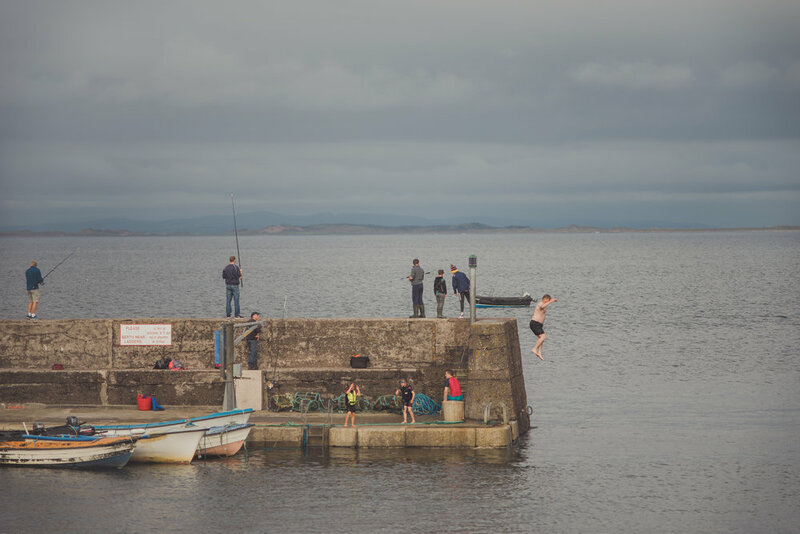 There was a lovely, lively atmosphere with gangs of kids all having a blast jumping off the pier and we enjoyed sitting by the water soaking in the views across the bay. It was our last day so we topped it off with another lovely meal in O’Connors back in Clochán and enjoyed some great traditional music for the night, joining in with some of the songs we knew. We truly hope this place never changes! Next day it was time to head to Ballinskelligs to meet Neil’s family. We were looking forward to spending quality time with them and showing them around our favourite spots from our previous trip. 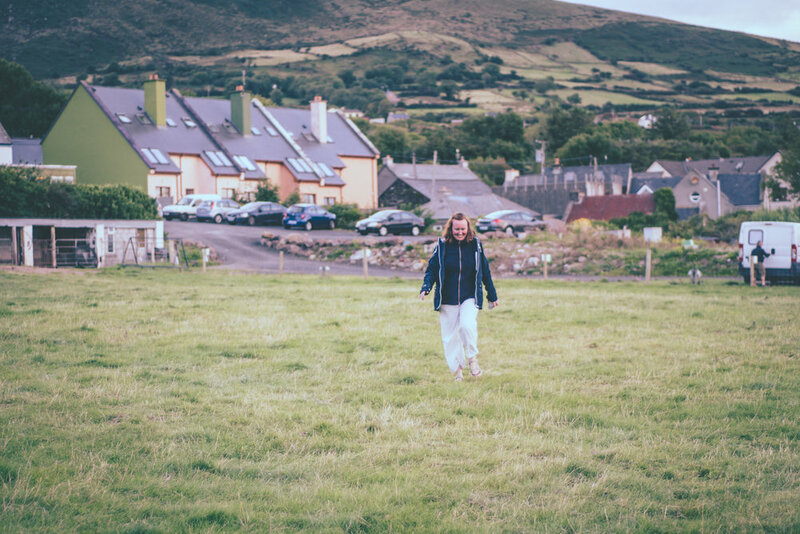 We all arrived quite late in the evening to The Skellig Lodge and Hostel and while Neil’s family settled into a big family room, we pitched our tent down on Ballinskelligs beach, intending on staying there for the next few nights. We had dinner together in Cable O’Leary’s near the beach and had an early night as we were looking forward to starting early the next morning. The weather wasn’t super but we made the most of it and took a drive to the Kerry Cliffs and the stone-age Ring Forts of Cahergal & Leacanabuaile near Cahersiveen. Neil’s sister did all the driving, fair play to her, even reversing backwards down on a tiny boreen to let other cars pass by (there’s quite a few roads like that in Kerry). For dinner that evening, we had to take them to The Oratory, an amazing pizza restaurant inside an old church in Cahersiveen and it didn’t disappoint. While we enjoyed our pizzas, outside, the weather had taken a turn for the worse and we came back to an absolutely soaking wet tent. Most of our bed, luckily, was still dry so we slept reasonably okay. Next morning we were lucky there was a room available in the hostel for us for the last couple of nights so while Neil’s family took a day trip around the Dingle Peninsula, we dried out our tent and gear and prepared dinner for us in the hostel kitchen. We had a great time mingling with the other hostellers and played cards and pool to wind down the night. We woke up to a beautiful sunny day and thought it was a perfect opportunity to bring them to Bolus Head for a walk. We had raved to them about how gorgeous the walk was from the last time we were down this way and we were delighted that the weather was on our side. We didn’t do the full loop but the views were spectacular and we were able to clearly show them the Skellig Islands. We had to explain to Neil’s young nephew, George, that they were really the top half of a dragon that was asleep out in the ocean! Between that, the Skelligs Chocolate Factory, and the 350 million year old tetrapod tracks on Valentia Island, he really had a great time on his first trip to Kerry. On our last day together we had another sunny day and spent it on gorgeous Ballinskelligs Beach. Neil’s mam, Cynthia, made us sandwiches while we went swimming and made tunnels in the sand with George. 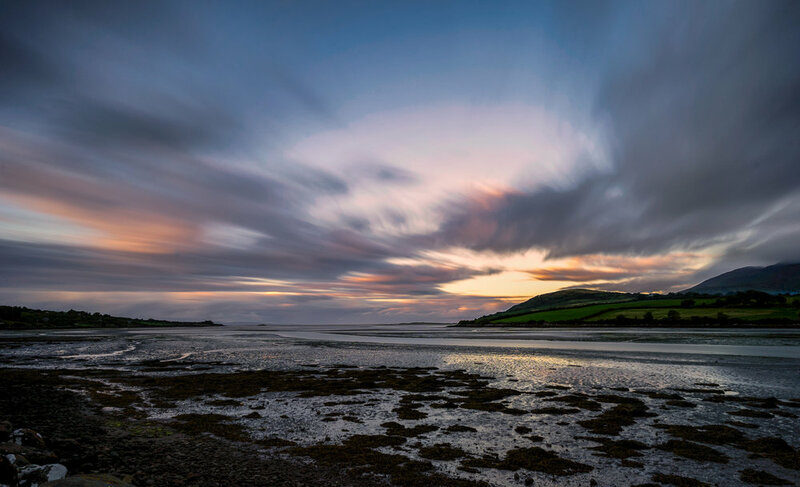 For our last meal of the holiday we went into Waterville, one of Ireland’s prettiest seaside towns, and tucked into fantastic pub grub in The Lobster Bar & Restaurant. It was a perfect end to a lovely family holiday in Kerry and we fell a little bit more in love with it! Put it on your bucket list! 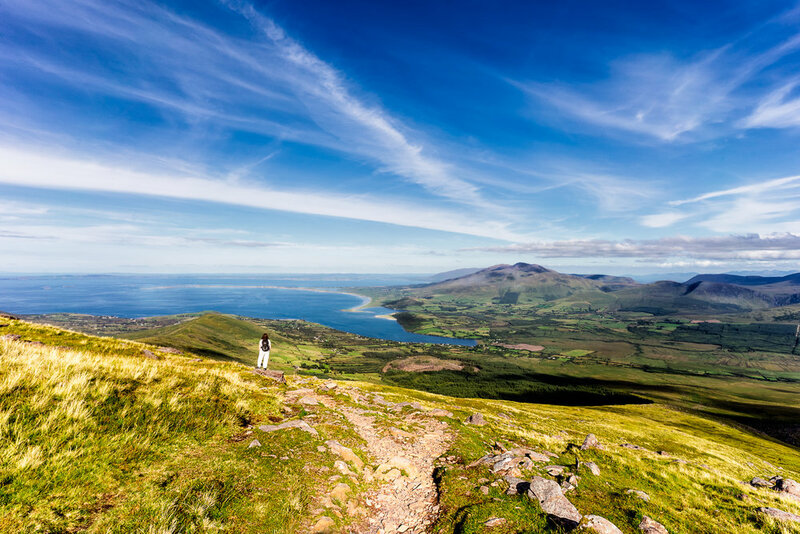 We love camping and hiking around Ireland and if you love the outdoors then there’s no better place than Ireland to immerse yourself in nature. 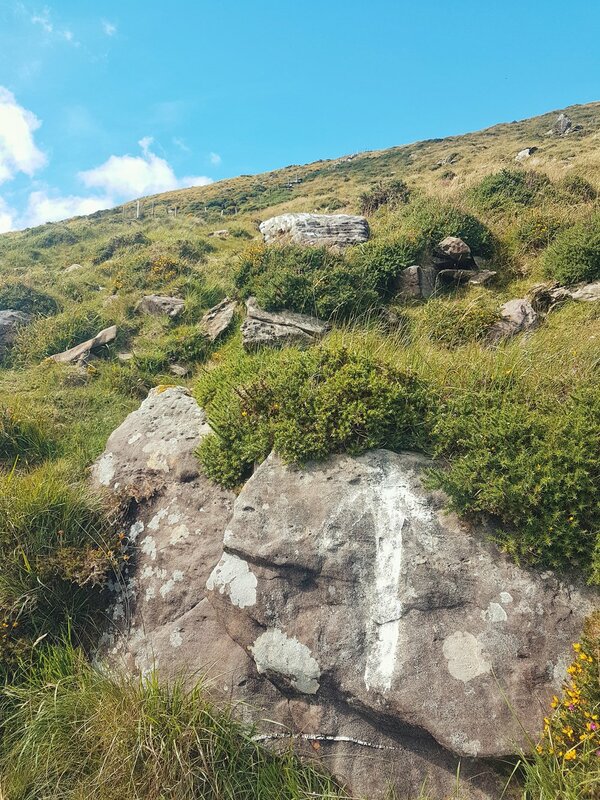 Find out about our Off season adventure and beauty in the Comeragh Mountains, Ireland and discover Why stunning Cork, Ireland needs to be on every bucket list.